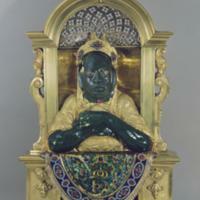 This sculpture is a composite, with a pre-Hispanic head made of greenstone set at the center of a gold and enamel niche. Only the greenstone head originated in the Americas. The rest of the sculpture—from the arms to the headdress to the niche itself—was created in the early 18th century by a European sculptor. The result is a luxury object crafted from precious materials to accommodate early 18th-century European tastes for fantastical forms and curiosities. The greenstone head at the center of the work is the only pre-Hispanic element of the sculpture. Its origin is not known, although the style and material suggest it may have come from Guerrero, Mexico, a region once occupied by the Olmec. Added to it were the headdress and the gold-rimmed and inlaid eyes, meant to enhance both the eye-catching qualities of the image and its preciousness (through the inclusion of other valuable materials). The arms are crafted of greenstone to match the face, but are 18th-century creations and represent an 18th-century understanding of sculptural form. Draping below the elbows, and sculpted to look like a piece of fabric, the cloth is actually made of gold and other metal. It suggests the taste for illusionism, as well as the skill of working luxury materials that existed in European courts. The original carver of the greenstone head was pre-Hispanic. The style of the carving and material suggest it could have been an Olmec creation, dating as early as 900 BCE. 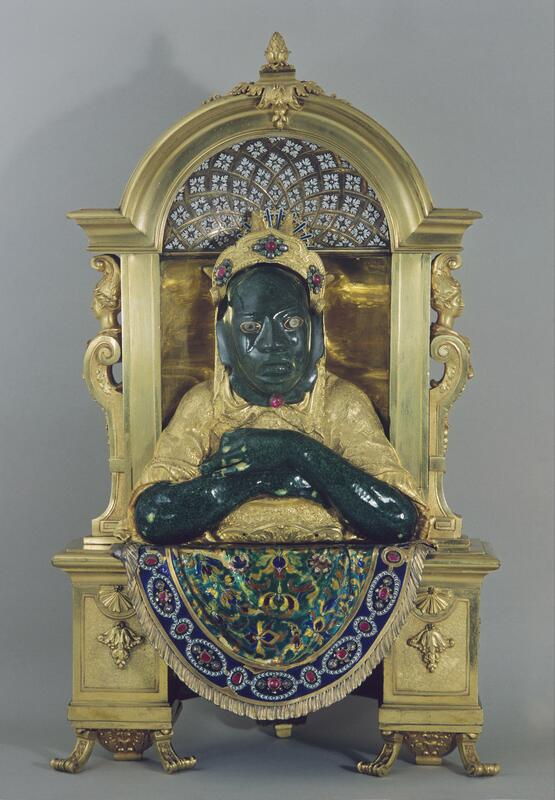 The niche, the gold and jeweled “crown” for the greenstone face, the golden dress and attached greenstone arms were made in the early 1700s, at least 2000 years later than the pre-Hispanic head. Guillielmus de Groff, a Flemish sculptor who worked for the court of Maximilian Emanuel in Munich, is credited as artistic creator of the ensemble. The pre-Hispanic greenstone head was carved with stone tools and, because greenstone is brittle and hard, it was probably worked by abrasion with sand. The niche was designed and then cast of precious metal in a European workshop. The mask measures ca. 11 cm (ca. 4.5 inches) in length, the gold niche ca. 60 cm (ca. 23.5 inches). Today this sculpture is in Munich. Guillielmus de Groff, the sculptor who most likely created this also worked in Munich, for the court of Maximilian Emanuel (reigned 1679-1726). In the 18th century, European interests in curiosities encompassed objects from Latin America, Africa, and Asia. The few pre-Columbian works preserved by European collectors were not necessarily appreciated as works of native craftsmanship. As shown here, some were absorbed into new, European works of decorative arts in the 18th century. Whether the creator of this work, or those who took pleasure in viewing it, knew the Mexican origin of the greenstone head is unclear. Many European collectors of the time confused pre-Hispanic greenstones with Chinese jades, which were commonly imported at the time. Consequently, the material and shape, rather than any specific reference to ancient American antiquity, were the prized qualities of the greenstone in this consummate luxury item. Boone, Elizabeth, ed. 1993. Collecting the Pre-Columbian Past. Washington D.C.: Dumbarton Oaks. Fuente, Beatriz de la. 1994. "Máscara reusada en la figura de un nicho." In Mexico en el mundo de las colecciones de Arte, Nueva España, Tomo 1. Mexico City: El Gobierno de la República, 47. Heikamp, Detlef. 1972. Mexico and the Medici. Florence: Edam. Mason, Peter. 1994. "From Presentation to Representation: Americana in Europe." Journal of the History of Collections 6: 1-20. Mauriès, Patrick. 2002. Cabinets of Curiosities. New York: Thames and Hudson. Sullivan, Edward.2007. The Language of Objects in the Art of the Americas. New Haven: Yale University Press.